Home » Campaigns » The mother of a murdered 14-year-old boy, Breck Bednar, is working with police on a film about how her son was groomed online. 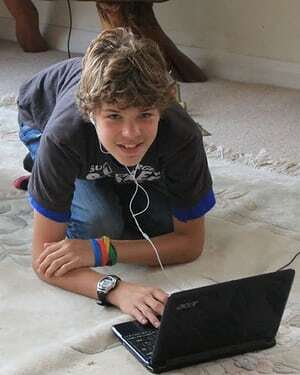 Lorin Lafave, Breck Bednar’s mother, campaigns to educate young people about internet safety. Leicestershire police are seeking to commission an independent film-maker to produce the short film, with the working title Breck’s Last Game. Lewis Daynes, the 19-year-old computer engineer who groomed Breck over the internet before luring him to his flat and killing him, was sentenced in 2015 to a minimum of 25 years in prison. Breck had told his parents he was sleeping at a friend’s house near their home in Caterham, Surrey, but secretly travelled to see Daynes in Grays, Essex, after months of talking on an online gaming forum. Lorin founded the Breck Foundation to educate young people and their parents about online grooming and internet safety, now speaks regularly to schoolchildren. To book your parents group or school parents group for the free two hour session please email communitysafety@warwickshire.gov.uk with dates and times that suit you.